Phillip Island showed its true mettle over the final three quarters on Saturday to inflict reigning premier Inverloch Kongwak’s first loss of its 2018 campaign, and first defeat since Round 13 last year. The hometown Sea Eagles got the early jump and led by 22 points at quarter-time – keeping the Island goalless for the opening term. But the Bulldogs came to life in the second, booting six goals to one for the quarter to take the momentum, and an eight-point lead, into half time despite losing Matt Jackson and Joel Piera to hamstring and ankle injuries respectively. “We just couldn’t get our hands on the footy in the first quarter,” Island coach Beau Vernon explained about the opening stages on Saturday. “They’re a good side and it took us a while to adapt – we probably went away from our game a little bit and were reactive rather than proactive. Vernon said Inverloch’s work-rate in the opening stanza was a difference-maker, adding that he thought his side was “convincingly beaten” in that regard. After losing Jackson and Piera to injury in the second, Vernon admitted his side had to be smarter in regards to both its rotations and ball movement – including slowing the play down at times in a bid to conserve energy. “It was really good character from our players – having two blokes down and fight it out the way we did,” he said. After trailing by eight points at half-time, the Sea Eagles made it just a one-point game midway through the third but, impressively, the boys from the Island responded. Vernon said the evenness of contribution across the board from his side on Saturday was a real key, and all season to date they haven’t had to rely on his one or two key goal-kickers to stand up and have an impact up forward. In what’s a particularly diverse and versatile, the likes of Mark Griffin, Aaron Edwards, Jordan Patullo and even Brendan Kimber have stepped up at stages throughout the season already. On Saturday it was Jack Taylor who slotted four majors, with Zak Vernon and Jarrod Witnish – in just his second game for the season – also kicking two apiece. Beau Vernon said his side could take plenty of belief out of Saturday’s result, given his players could see proof that what they’d been training and focusing on would reap rewards. 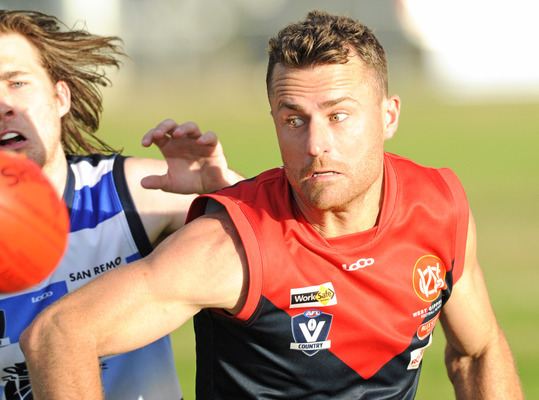 While Vernon struggled to identify any standout players on Saturday – given the evenness of their strong contributions right across the board – he did highlight the strong form down back of both Leigh Warne and Will Van Diemen. 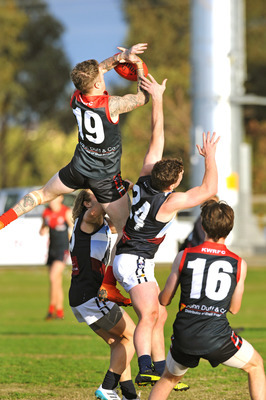 Though the boys from the Island ultimately came away with a four-goal win on Saturday – 12.11 (83) to 8.11 (59) – they know they have to capitalise on that effort with another strong showing this week in another blockbuster, against the third-placed Kooweerup. The Demons were predictably far too strong at home for the Panthers on Saturday, recording a big win – 18.10 (118) to 5.9 (39) – set up largely by a seven-goal unanswered opening quarter. 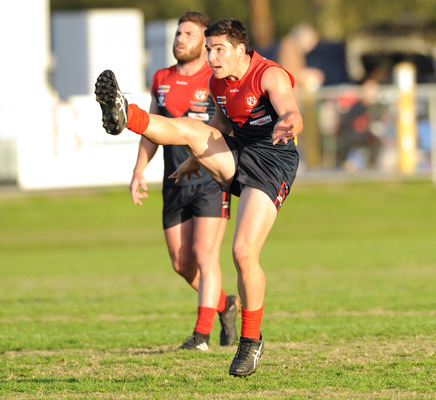 Small forward Anthony Giuliano continued his impressive run of strong form with another three majors, while Josh Smith and Jason Wells also booted three apiece. Nathan Muratore and skipper Tim Miller were two of the home side’s biggest standouts, while Taylor Gibson again impressed for the visitors – as he’s done throughout their whole campaign to date. Elsewhere across the competition on Saturday, Nar Nar Goon recorded a 133-point trouncing of the Magpies at Dalyston, 23.18 (156) to 3.5 (23); and Korumburra-Bena recorded its second win of the season with a 39-point win at the showgrounds over the struggling Bunyip, 13.10 (88) to 7.7 (49). The Giants had 10 scoring shots to just three in the opening term but still led by just 14 at half-time. Yet it was in the third term where they inflicted the real damage – setting up their win. Alex Johnston’s strong season continued for the home side on Saturday with another best on ground display, while Ben Fitzpatrick (two goals) also shone. Cley Bertoncello, meanwhile, kicked three majors and was among Bunyip’s standouts in his senior debut for the club. In the other contests this weekend in Round 10, Cora Lynn hosts Inverloch Kongwak; the Panthers travel to Dalyston to take on the Magpies; Garfield hosts famous neighbouring rival Bunyip; and the Giants host Nar Nar Goon at the showgrounds.